The R/V Falkor, the newest research vessel of the Schmidt Ocean Institute (SOI), departed on her first transatlantic voyage on July 2 from the Port of Tyne in the United Kingdom, and arrived at the Woods Hole Oceanographic Institution in Woods Hole, Massachusetts on July 28, 2012. This cruise was a part of the shakedown phase of the R/V Falkor initial science operations. During shakedown, all of the systems and oceanographic instruments on board the ship were be tested and calibrated. The ship’s layout and functionality was evaluated against the needs of future scientific expeditions. To better understand the capabilities and limitations of the R/V Falkor during this initial cruise, SOI invited scientists from the Woods Hole Oceanographic Institution, the University of Rhode Island, and the University of Granada (Spain) to participate in this cruise. These scientists helped SOI verify the scientific capabilities of the R/V Falkor while also collecting valuable scientific data along the route. All on-board systems were tested, including a variety of embedded science systems, the ship’s services and machinery, as well as the ship’s general characteristics, such as the performance and the configuration of the ship. The resulting operational knowledge obtained from this voyage is being used to improve the capabilities of R/V Falkor as SOI strives to bring her to the status of one of the world’s premiere research vessels. Having been recently refitted and renamed, R/V Falkor underwent routine maintenance and preparation for the transatlantic voyage near Newcastle, UK. Cruise participants, including the crew and the scientists, actively prepared for the voyage. All of the necessary instruments, materials, and equipment were shipped to Tyne for the transatlantic voyage. SOI Captain Bernd Buchner was in charge of taking R/V Falkor across the Atlantic Ocean on her first shakedown voyage with working scientists on board. The responsibilities of Captain Buchner included all safety and operational decisions on board the ship throughout the cruise. SOI Chief Engineer Miro Mirchev oversaw all propulsion and machinery systems on the vessel. He also was in charge of assuring that clean electrical power and all other basic services, such as lights, sewage, heating/air conditioning, and water were available in all areas of the ship to support ship’s normal operations and operate all scientific systems. Four SOI oceanographic marine technicians were on board the ship for the duration of the cruise. Marine technicians liaised between the Chief Scientist as well as the rest of the attending science party and the ship’s Captain and crew members. They also supported the operation of scientific equipment that is permanently installed on board R/V Falkor, organize and transport instruments, materials, and supplies, help collect and process scientific data, and otherwise support research activities as may be requested by the Chief Scientist and other members of the science party. Throughout the shakedown, SOI crew members continued to be comprehensively trained to support all facets of R/V Falkor operations, including, safety, engineering, navigation, habitability on board the ship, as well as science operations. The ship’s dynamic positioning system – a computer system that automatically maintains the ships position and heading – will continue to be tested and calibrated during the voyage. 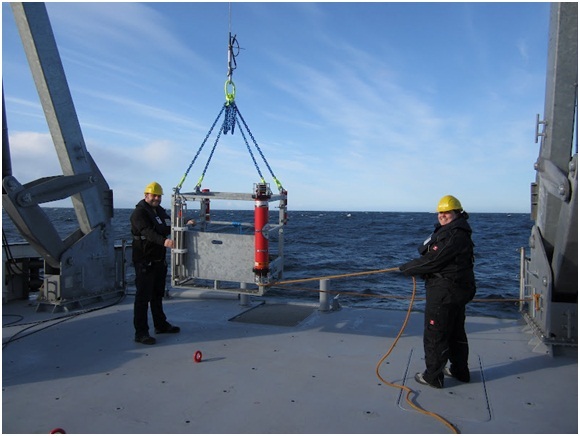 All of the scientific equipment on board was tested at sea during the shakedown period to verify the functionality and accuracy of the equipment. A comprehensive suite of scientific echosounders were just some of the most sophisticated systems installed on R/V Falkor. Echosounders use sound pulses to characterize seafloor topography, measure ocean depth, and evaluate numerous other properties of the ocean. Jonathan Beaudoin from the University of New Hampshire and Xavier Lurton from Ifremer, a French national institute for ocean research, are globally recognized experts in performance evaluation and calibration of acoustic echosounders. They were both on board R/V Falkor during the upcoming transatlantic cruise to conduct deep-water performance evaluations of the these systems. Other equipment that were tested include the Sea-Bird CTD profiling system. This system measures Conductivity, Temperature, and Depth of a deployable tethered probe. Despite the name, all CTDs actually measure pressure, which is not quite the same as depth. The CTD data can be used to calculate salinity, density, sound velocity, and other parameters of interest and the 24-bottle carousel water sampler is used to collect up to 24 independent 12-liter water samples from various ocean depths for onboard analysis. 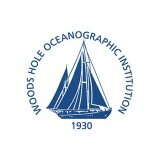 Cabell Davis of the Woods Hole Oceanographic Institution served as the Chief Scientist on board the ship. His group tested a new state-of-the-art Video Plankton Recorder, a high-speed video microscope used for underway mapping of plankton taxa and environmental variables, including salinity, temperature, light, nutrients, chlorophyll, and turbidity. During the second leg of the voyage from Nuuk, Greenland to WHOI, CTD data was collected measuring a suite of variables including microbial DNA, nutrients, volatile organic compounds, and stable isotopes for tracing food web and water mass properties. Dr. Davis and his team was the first active science team on board the R/V Falkor, and helped SOI evaluate the organization and functionality of R/V Falkor for future scientific expeditions. When refitting the ship, engineers paid special attention to the general arrangement of the R/V Falkor with hopes of improving upon the layout of the previous SOI vessel, the R/V Lone Ranger. “We’ve really tried to design the Falkor for a multipurpose oceanographic research platform that can satisfy, hopefully, the needs of many scientists who are operating in their countries without normal access to research ships,” said Eric King, Director of Marine Operations at the Schmidt Ocean Institute. The shakedown phase of the R/V Falkor continued throughout the rest of 2012, with four more shakedown cruises between August and December in collaboration with researchers from the National Oceanographic and Atmospheric Administration, Texas A&M University, University of Mississippi, and the National Institute for Undersea Science and Technology. 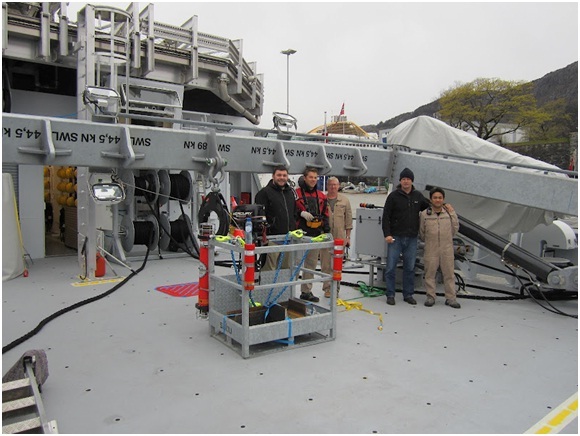 The first post-shakedown scientific expedition on board the R/V Falkor took place in early 2013. Stern A frame shown in the fully inboard position. Winch test and training operations during sea trials. The eventlog and data from the VPR sensor are archived at BCO-DMO. No cruise related news at this time. Check the Cruise Log for updates.